A refractory log set is required to complete the look of the gas burner assembly. The logs within this set will be molded to fit the exact burner used in this model. * Please Note: This item requires an Outdoor Wildwood Refracotry Log Set. The Empire OP36FP32MN Carol Rose Outdoor Stainless Traditional Premium Fireplace is one of the best on the market. Featuring a traditional design, it complements any outdoor area. With 50,000 BTUs of power, it is sure to keep you warm as well as adding the desired ambiance to your space. 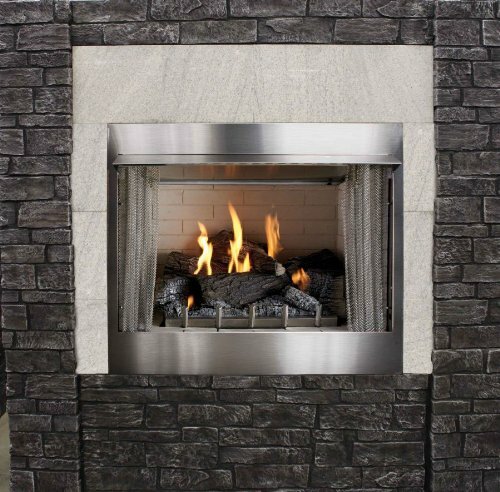 This 36-inch fireplace includes an on/off millivolt, refractory liner, standing pilot/piezo, and a refractory log set. It has fireplace controls but is remote-ready as well. Because Empire cares about you, the fireplace has been manufactured using high-quality materials. It is created for easy installation and is constructed for durability so that you can enjoy your fireplace for many years to come.